I had such a blast at the Texas Stampede!!! I loved meeting lots of new people and seeing so many people I know!! I thought that I would share some pictures with you! Robyn, My Comadre Angie, and me. I will never forget now, our LA meeting! It was good to see you again! Robyn and I with a fun goodie from Valerie! Thanks for the great Yummies! And here is our make up picture! Kristen it was fun getting to know you! I loved saturday night! 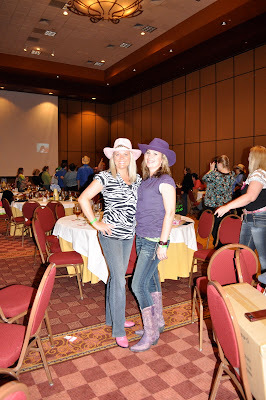 I got to get all gussied up in my purple cowgirl gear and do some line dancing! We had so much fun! Thanks everyone for dancing with us crazy gals! We had a real fun My Pink Stamper Live Pink Pajama Party! It was fun having Monique as Robyn's special guest and having a bunch of new friends hanging out in the room with us! I know that I didn't post the winners on Friday. So I wanted to make sure that I posted them today! I have already emailed you so check you email! It really seems you all have such a wonderful time no matter where you all are at. I am glad for you all. Watching for your next project. Do we get to see pics of you line dancing? lol! So much fun you girlies have ! Oh I hope to get to go to one of these events with all of you ! We would have such a blast ! So glad y'all had a wonderful time !! Yee Haw.. sure looks like you guys had a lot of fun. Would love for you to come to Florida. AWWWW...it looks like you ladies had so much fun!!! Congrats to the winners! I was on a mini vacation and just caught the end of MPS Live from my hotel room. You guys crack me up! Have fun this week with Robyn and please make some fun videos!! What FUN pix! Have ALL my fingers & toes crossed to someday be able to go to something like these GALAS! Feel like I know you girls, but would love to meet you & Robyn. P.S. If you see this before you leave Robyn's...you should "plant" a few prizes or fun notes in Robyn's studio, so she finds them after you go home! I LOVE to do that! Thanks for the pics Karlee; these are awesome and it looks like it was sooo much fun! It was wonderful getting to know you too Karlee!!! I hope you guys had a safe drive back!!! Looking forward to seeing you all again in the near future!!! Looks like so much fun, thanks for sharing your pictures! Both of my Comardre's Karlee and Robyn mentioned me on their blogs! You both made me feel so special! Thank you!! Remember to roll your R's LoL! The LA meeting is unforgettable and the Stampede is one to remember. You both rock! Can't wait to see you both again. Smiles and Hugs!! your Comadre Angie! !